In the far reaches of the future, two aliens, Grundle and Dundor, answer a distress call that they spot on a planet in the Forbidden Cluster. Unfortunately for the two philanthropic explorers, the signal was created by none other than the monstrous shark-like alien known as Armaggon (from TMNT Adventures #42-44). After Grundle lands the spacecraft, Armaggon attacks and takes the two men hostage and commandeers the craft. 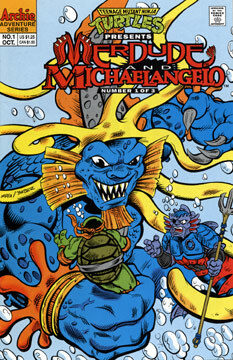 Back on Earth, Michaelangelo meets up with Merdude and the two head off into the deep seas to hang out. Back on the spacecraft, Armaggon is furious that the technology at hand doesn’t meet his demands. The amicable aliens only have the ability to open a small time portal (which they send probes through to gather information). Armaggon had wanted to travel through time to destroy the TMNT, but faced with this situation, he decides that his unwilling comrades will modify one of their probes so it will be able to perfrom a task. Meanwhile, Merdude and Mike arrive in an underwater cave and the aquatic mutant shows his turtle friend an ancient plant called Lorien that has remarkable qualties. Mikey chews a few leaves from the plant and they enable him to breathe underwater! Merdude explains that this is but one of the magical abilities that the plant contains. By now, Grundle and Dundor have modified the probe to Armaggon’s demands. The vile shark explains that the probe will go back in time to the bottom of the Earth’s ocean, tunnel through the sediment and awaken the long slumbering Kraken – which will destroy all life on the planet, including the TMNT. Merdude tells Mike that the plant has amazing healing abilities. Any sick creatures that he encounters are always cured by chewing just a few leaves from the plant. Mikey is very excited about this news, as he thinks that they’ll be able to plant seeds from Lorien all over the ocean floor and use them to save millions of lives – but Merdude states that he has already tried this thousands of times, but the seeds will not grow anywhere. Mike is bummed, but Merdude says that Don might be able to figure something out, and the two swim off – only to nearly collide with the probe sent by Armaggon. Our heroes follow the strange machine, which quickly burrows into the ocean floor. The probe soon finds its goal, and it awakens the giant Kraken, which erupts from its slumber and immediately starts draining the life force out of the creatures it finds. Mikey attacks the brute, but he’s easily captured and his life is drained by the monster! Shocked, Merdude hatches a desperate plan and rushes back to where the Lorien is – he pulls the entire plant from the sand and swims back to face the Kraken. The beast is amused by Merdude’s defiance, and the mutant uses this to his advantage and tosses the plant into the Kraken’s mouth. The gargantua swallows Lorien and its abilites take quick effect – for even the mighty Kraken cannot handle such a large does of the plant, and it falls into a coma. Merdude laments the loss of the amazing Lorien, but he spots the prone form of Michaelangelo and rushes back to the cave that housed the plant. Merdue recalls that he had left the roots of the plant and hopes that they’ll have enough power in them to save Mikey. Fortunately the roots do the trick, and Mike is quickly revived. Merdude explains that Lorien is gone now, and he sadly begins to swim off. Mikey notices something in his mouth… he didn’t swallow one of the plant’s seeds. Figuring he has nothing to lose, Mikey plants the last seed where the original Lorien had lived for thousands of years and swims off to join his dejected friend. As the two disappear into the murky depths, something magical happens inside the cave… the seed sprouts a new Lorien plant.